The area was originally planted with the ancient “Graecanicum” (coming from Greece) variety. This name was then transformed into “Garganega” in the local dialect. During the ‘60s Giuseppe Inama, the estate’s founder, began purchasing small plots of vineyards in the heart of the Soave Classico. His idea was to assemble only top quality vineyards of old-vine Garganega, and fashion from them a wine capable of restoring Soave’s reputation. The Soave Classico is a volcanic area, characterized by the presence of mafic and ultramafic rocks. It dates back to 30 million years ago (Upper Paleocene – Lower Oligocene). Monte Foscarino, as well as the area surrounding it, present a variety of soil: they go from basaltic lava, to volcanic tuffs, to the so-called “orizzonti rossi” (red clays formed by volcanic rocks alterations). The Inama property sits on 30 hectares of land. 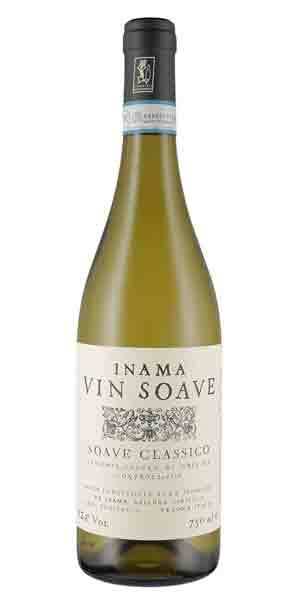 Inama Soave classico represents half of the estate’s production. It is a beloved classic that can be enjoyed anytime. Made from 100% Garganega vinified in stainless steel tank. It is not fruit-driven; but mineral and floral notes that clean the palate, making it food-friendly with lots of dishes. Floral and mineral driven as expected for a white wine grown on volcanic soil. On the nose there is the nectar of field flowers such as camomile, elderflower, iris. Clean minerality on the palate with almond notes on the finish.